In the third and final book in this action-packed trilogy, the Barker brothers and their good friend Delilah secretly climb up to Superstition Mountain one last time. There are still mysteries to solve - is the creepy librarian really the ghost of Julia Thomas from a century before? What was their uncle Hank's role in discovering the gold mine? Can they still get into the gold mine after the avalanche that nearly crushed them? Does their cat, Josie, have mysterious powers? And, most of all, who is trying to kill them? Elise Broach delivers a page-turning finale to this top-drawer adventure trilogy. Praise for "Treasure on Superstition Mountain"
Praise for "Missing on Superstition Mountain"
"[An] engrossing mystery. . . . Broach reserves plenty of suspicious characters, spooky landscapes and loose ends for the slated sequels, which both boys and girls will savor." --"Kirkus Reviews"
"Ms. Broach . . . purposely leaves storylines dangling, the better perhaps to lure us back for sequels that will (we hope!) disclose what has gone missing on Superstition Mountain." --"The Wall Street Journal"
* Broach builds on the daring escapades and eerie tension . . . in this stellar sequel. Readers will be eager for the next installment. "Publishers Weekly, starred review on Treasure on Superstition Mountain"
* Classic horror and thriller elements combine with modern touches in Broach's page-turner, a very promising start to this series. 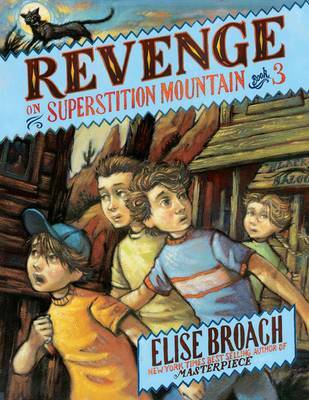 "Publishers Weekly, starred review on Missing on Superstition Mountain"
[An] engrossing mystery. . . . Broach reserves plenty of suspicious characters, spooky landscapes and loose ends for the slated sequels, which both boys and girls will savor. "Kirkus Reviews on Missing on Superstition Mountain"
Ms. Broach . . . purposely leaves storylines dangling, the better perhaps to lure us back for sequels that will (we hope!) disclose what has gone missing on Superstition Mountain. "The Wall Street Journal on Missing on Superstition Mountain"
A spine-tingling adventure. . . . This first book in a planned mystery series is the perfect antidote to those summer doldrums. "Shelf Awareness on Missing on Superstition Mountain""